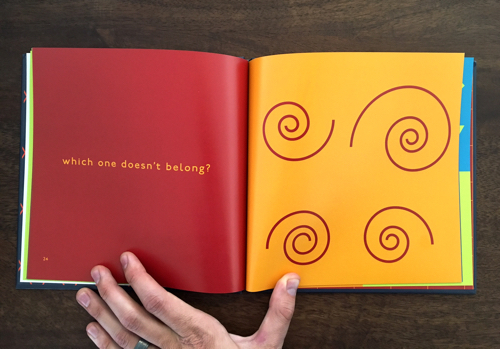 Stenhouse just released Christopher Danielson’s book, Which One Doesn’t Belong? It’s a must-have if you’re a parent or a teacher with any interest in helping your children or students learn to speak mathematically. There are few tasks that offer so much mathematical value yet require so few instructions as Which One Doesn’t Belong? You see four mathematical objects. You ask kids, “Which one doesn’t belong?” You help them negotiate their overlapping and conflicting answers, developing vocabulary and the capacity for argument and abstraction along the way. That’s it. You can find loads of great WODB prompts online but you can’t find Christopher’s unique presentation, narrative, and teacher’s guide, which is its own kind of graduate-level course in pedagogy. Students only ask three types of questions: (1) proximity questions – asked when the teacher is close; (2) stop thinking questions – most often of the form “is this right”; and (3) keep thinking questions – questions that students ask so they can get back to work. Only the third of these types should be answered. The first two need to be acknowledged, but not answered. When my students ask “Is this right?” or express uncertainty about their answer I like to ask them what their confidence level is. 25%? 50%? 75%? etc… If it’s less than 50% then I ask them why they are unsure. If it’s over 50% then I ask them what gives them confidence. Basically, after dealing the cards, the basic idea is for kids to pass one card to the left while at the same time receiving one card from the player to their right. The object of the game is to collect all cards with the same suit/type/category. Here are two examples that I recently created for next year. I choose a number between 1 and 1000 and write it on a piece of paper. Each group takes it in turns to ask me a questions about my number. The questions can vary from “is it even?” to “what do the digits add up to?” to “is it a palindrome?” (my classes know I like palindromes!) When a group thinks they have figured it out they write it down and bring it up to me. Each group is only allowed three attempts so cannot keep guessing randomly. I like this for emphasising mathematical knowledge such as multiples, primes, squares, etc. As a member of the Better Math Teaching Network, I had to come up with a plan – something in my practice that I can tweak, test, and adjust with ease. So, I decided to focus on class closure. Since I don’t have an actual process for this, I had to think intentionally about what I might be able to do. I created this process map. We can make the idea of peer observations commonplace. It’s time to take the first step. The Red Cross is asking for certified teachers to help out in the shelters. What would you do if you were asked to help? What kind of activities could be done in a shelter with children and a minimal amount of supplies? 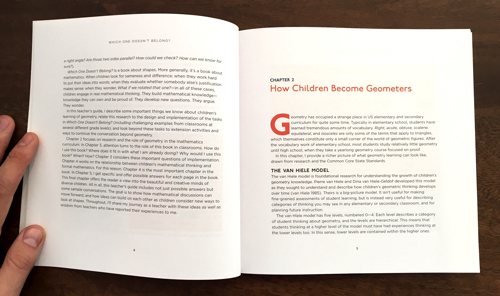 Given those constraints, I’d probably use the print-based portions of Jo Boaler’s Week of Inspirational Math along with a bunch of the Tiny Math Games we collected several years ago. I’d probably cry a bunch, too, I don’t know, Jesus man what a horrible situation. Lowering standards, as in Utah, where you can now become a teacher without any additional training beyond content certification, or in Pennsylvania, where they’re relaxing the content certification requirements themselves. Abusing the H1-B program by hiring teachers from the Philippines, Spain, and Mexico. Increasing recruitment efforts by reaching out to college sophomores and juniors more aggressively, by reaching out to former district graduates who might want to teach at their alma mater. Increasing new teacher retention through mentorship programs, especially residency programs, which often pair new and veteran teachers, offer stipends, and require multi-year commitments. Sending administrators back into the classroom, in one case. Doing not really much of anything that I can tell, in another case. This is to say nothing of macroeconomic trends that may require federal action. For example, the 2008 recession resulted in the layoff of newer teachers (hi!) in favor of veterans who are now retiring and it turns out those newer teachers didn’t stick around. I don’t claim any kind of policy insight. I just find all of this interesting and a little terrifying. If the states are laboratories of democracy, we’re about to watch a number of lab experiments performed on our nation’s kids. There’s a bill to raise teacher pay by 3 percent, and another proposal for 4 percent. The leader of the Senate, President Pro Tempore Del Marsh, R-Anniston, is working on a bill that could offer some teachers a higher rate of pay if they elect not to enter the teacher tenure system. This year, lawmakers made some progress addressing the problem. They sent the governor a bill that would provide $500,000 for incentives to drive teachers to rural Colorado. The legislation would: Create education training programs through coordinators at colleges in rural parts of the state. Provide stipends to offset tuition costs for student teachers who agree to teach in rural schools. Establish programs in rural areas to identify high school students interested in teaching. Provide money to teachers in rural districts who pursue national certifications. In Pinellas County, teachers can get up to $25,000 in incentive pay to work at low performing schools, which are currently under investigation by the U.S. Department of Education. But to get the full amount, they must have a master’s degree, be at the top of the pay scale, work 90 extra minutes a day, plus some Saturdays — and attend summer sessions. “There’s an ambulance waiting for them at the end of the rainbow there, because it’s almost undoable,” Gandolfo said. The Blue Ribbon Commission on the Recruitment and Retention of Excellent Educators – a panel of 49 state office holders and educators – last year issued a report with suggested solutions for state legislators to consider in the 2016 session, however, only one related bill passed. It sets up the New Generation Hoosier Educators Scholarship, which offers up to $7,500 per year for students who commit to teaching in Indiana for at least five years. Iowa College Aid has announced that 126 teachers were offered awards as part of the Iowa Teacher Shortage Loan Forgiveness Program. The average repayment was $5,493, for a total of $692,171. Moore said that his district has offered candidates for positions such benefits as a four-day school week, health benefits and a competitive salary, and candidates are still not willing to accept positions in rural areas. The school district is currently in negotiations with the tribe in Owyhee to see if they will be able to provide housing for teachers. However, Zander acknowledge that finding housing in areas like West Wendover where there isn’t any teacher specific housing available may still be a challenge. Bracy said part of the state’s teacher shortage has to do with fewer college students enrolling in education majors. Another part has to do with low pay, he said. “It sometimes makes the teaching profession not as attractive as others,” Bracy said. Governor Pat McCrory recently signed the state budget, which would allow a 5 percent increase in pay for teachers. That means the average teacher could make close to $50,000. The state’s teacher shortage loan forgiveness program has so many applicants that it can no longer fund all who apply, North Dakota University System financial aid director Brenda Zastoupil told the Education Standards and Practices Board on Thursday. This year, 628 teachers applied to receive up to $1,000 in forgiveness from their college loans. Last year, the number was 525 and the year before, 471. The program allows teachers to apply multiple years for a maximum of $3,000. Voters will have a chance to help teachers out come November due to a proposed state question that will raise sales taxes by 1 percent statewide, which is expected to generate $615 million annually, with about 70 percent designated for a $5,000 pay raise for Oklahoma teachers and other funding for K-12 schools. Republican Gov. Mary Fallin also has discussed a possible special session that could restore some education funding. Frances Welch, dean of the College of Charleston’s Teacher Education Department, said she has seen student enrollment in her department shrinking for years now. She said the state needs to expand student loan repayment programs, such as the Teaching Fellows scholarship, and minority recruitment programs, such as Call Me Mister. The Office of the Superintendent of Public Instruction asked the Legislature this year to raise the salary for beginning teachers, and add signing bonuses and other incentives to make the profession more attractive. Yet, the salary issue cannot be ignored. According to the Wisconsin Department of Public Instruction, the average public school teacher had 14 years of experience and made a salary of $49,908 in 2013-’14. By comparison, the U.S. Census Bureau calculated that the average salary for a bachelor’s degree holder nationwide in the same year was $62,048. He’s one of the many Savannah-Chatham schools hired through the Alternative Pathways to Teaching program. It’s a way those with a Bachelor’s degree in any field can become a teacher in Georgia, through a work-as-you-go certification program that takes one to three years to complete. The board discussed the possibility of busing students to Stanfield, or using curriculum the ODE has established for small schools where an adult supervises classroom learning but does not have to be a licensed math teacher. The prospect is sufficiently worrisome to Pennsylvania Department of Education officials that they are eliminating obstacles to becoming a teacher – for instance, by easing math requirements on the basic skills assessments that teaching students take as sophomores and have struggled to pass. Utah has a severe teacher shortage, so it decided to do something about it. Under a new rule, schools can now hire people to teach who have no training in the profession. None whatsoever. At the start of the summer, Goodsell hired a few recent graduates from out-of-state education colleges. Next, he began Skyping with high-school math and science teachers in the Philippines who had applied for work visas to teach in the United States. He selected 11. Lewis said her district hopes to fill math, science and special education jobs with teachers from the Philippines. Capitalizing on connections of previously recruited Filipino teachers, officials conduct interviews via Skype and, if successful, navigate the long process of securing an H-1B visa. Dallas employs some 350 teachers from Puerto Rico, including some who have become administrators. The district’s H-1B visa program recently brought in 30 Mexican teachers who will stay for three years. Dallas ISD also takes part in the Texas-Spain Visiting Teacher Program, a J-1 visa initiative that each year brings about 75 Spanish teachers to the district for three years. Wilson says with money tight, they’ve been all about hiring quality teachers instead of just filling their quote. He says that all starts with getting good student teachers from [Southern Illinois University]. Krysl says because of the hiring freeze, they looked for talent from colleges, towns, and states they hadn’t actively recruited from. That’s where they found teachers like Amy Shamp who moved here from Owatanna, Minnesota to teach at Curtis Middle School. Murphy said the school system has been working to stay in contact with graduates interested in becoming teachers to return to Charles County. “We’re hoping to create that pipeline and connect with those students throughout the years,” Murphy said. “I think it’s all about getting people to go into the teaching profession and that means talking to maybe junior and seniors in high school or freshman and sophomores in college,” he said. Ritter in 2012 founded the Arkansas Teacher Corps, which recruits the highest achievers from all majors and fields to teach in districts that struggle to hire and retain quality teachers. Corps teachers receive a $15,000 stipend, paid over three years, in addition to their regular teaching salary for working in such a district. “More teachers are leaving, and fewer teachers are going into the profession,” said Corey Rosenlee, president of the Hawaii State Teachers Association, which represents 13,500 teachers. “We cannot find even emergency hires for these positions.” DOE officials contend that the hiring process is selective and that more focus on a mentoring program for new teachers will continue to boost retention rates. In Richmond, a more intensive teacher residency is helping retain both new and veteran teachers, said Jan Tusing, a teacher leader-in-residence at VCU’s Center for Teacher Leadership, which runs the residency program. The residency program is an intensive multiyear process where new teachers are paired with a co-teacher. The program’s original goal was to provide extra help for new teachers, but it ended up helping retain the experienced teachers who served as mentors also, Tusing said. That’s a win-win for districts. “You have so many more schools than you did 10 years ago,” Armenta said. “We’ll do what we did last year, and that is, in those classrooms where we haven’t found teachers yet, we will send in administrators from city center again to fill in.” That means administrators who have desk jobs now but are still licensed to teach will be in the classroom. My only complaint is some of your pejorative language (e.g., “abusing work visas”; “experimenting on students”). You may have good reason to disagree with some or all of the responses, but it seems that this requires some argument rather than name-calling. That these states are performing experiments on kids seems just empirically true to me. I am, indeed, editorializing about the H1-B. That program was meant to staff hard-to-find individuals in specialty fields. While I agree that teaching is a specialty field, teachers aren’t hard to find so much as hard to compensate and treat in a way that’s fair. Teachers are, in my view, underpaid, undervalued, overworked, and deprofessionalized. The solution is to fix those working conditions, not exploit an immigration loophole to find people who will tolerate them. 1. Part of neoliberal ed reform has been to denigrate teacher prep. Enrollment down in most ed programs in the US. This cuts supply. 2. Re: H1-B visas: as @LoraBartlett's research showed, many overseas trained teachers send remittances home & live in economic precarity. This makes them less able to advocate for themselves as workers. 3. As @DanaGoldstein and others have talked about, shortages also a result of turnover. Best strategy on Dan's list: retention & pay.